If you're just starting out in chair caning and plan to do more, you need these tools. These are Made in the USA superb quality tools. 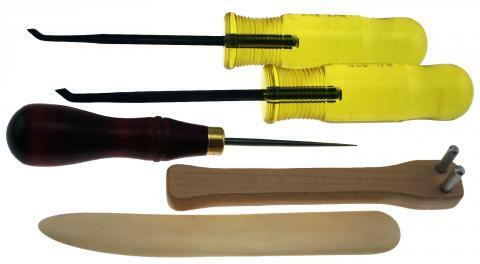 One caning awl, one cane packing tool, one 3/16" caning chisel, one 1/8" caning chisel and a bone awl. Chisels are for cane webbing work. The awl and cane packing tool are for hand-caning. The bone awl is indispensable for seat weaving. $49.35 if purchased separately. Comes in plastic carton.